Drawing on lessons from her own incredible journey--together with insight from conversations with thousands of other women--Rachel encourages moms to break cycles, take off masks, and prevent fear from taking control. She balances her "no excuses" approach with breathing room and grace for those messy moments in life and mothering. Rachel reminds you there is always a reason to hope, to move forward, and to dare the impossible. You can make changes. You can pursue dreams, find yourself, and live a life of deep happiness and boundless joy. Stop waiting for "someday." Take hold of the moment, and say yes to your dreams. If you've already been following Rachel via her blog, you will already know what to expect from this book, and you will NOT be disappointed. This book is very open ad honest and truly speaks to us as a friend. It beautifully weaves in her own personal stories and experiences, with thoughts and lessons learned from those experiences. This is my favorite type of 'self-help' books to read, because I truly feel like it's someone who gets it. It's not just some professional motivational speaker who is telling us how to live, despite their lack of first hand experience... but again, like I friend saying 'this is what happened, and this is what I've learned'. It's not only much more motivational, but it makes for a much more entertaining read. I've stumbled upon FindingJoy.net a few times here and there, though I cannot claim to have been an avid follower by any means, so I really enjoyed getting to know Rachel and experience her effortless writing style. I feel like it is something many women will relate to, and would be an ideal book club choice for your mom group too! Ready to experience it for yourself? 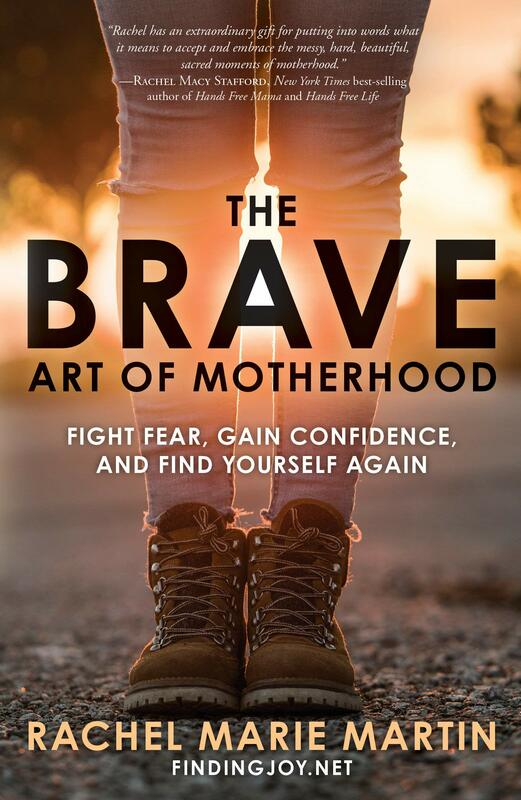 The Brave Art of Motherhood is available to purchase now.